Exhaust this card and pay 1 action token to reveal the top 3 cards of your deck. You may put 1 revealed Event into your hand and all remaining cards on the top of your deck in any order. 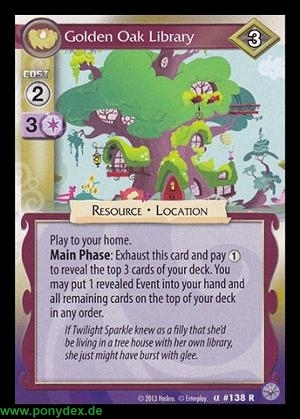 If Twilight Sparkle knew as a filly that she'd be living in a tree house with her own library, she just might have burst with glee.